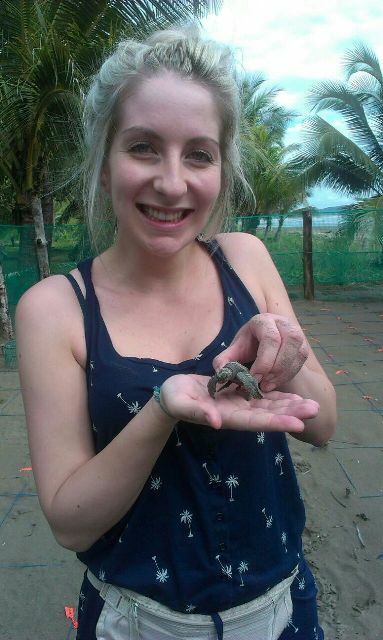 Today we have a fantastic first-hand account from Faye Simpson of what it is like volunteer in Costa Rica with turtles. Keep reading to find out all about what it is really like to go on night patrol, look for turtle tracks and help release hatchlings back into the sea. ‘Costa Rica was brilliant. From the moment we got off the bus and were met by the sweltering heat it was clear that we were far from home. However it was a great experience to be immersed into such a different culture. The atmosphere was relaxed – the volunteers and locals were very friendly. Beach life is very chilled and there was plenty of free time to hang out and get to know the other volunteers a bit better and enjoy the amazing weather. It wasn’t easy waking up in the middle of the night to get ready for patrol but when I saw my first adult turtle it was totally worth it. Seeing her root around for somewhere to nest, then waiting patiently for her to dig her nest before we moved in to collect the eggs was very exciting. I will never forget reaching into the hole and collecting the eggs, and the responsibility I felt for carrying 130 fragile lives back to the hatchery in darkness! Early one morning on a dawn patrol we saw a turtle struggling to dig because she had sadly had one of her flippers badly mangled in fishing wire which had stunted the growth. We managed to flip her over and, with great difficulty (and a lot of sand flicked into our eyes! ), helped to remove the wire. Watching her limp back to the sea was really sad but reminded me of the importance of the work of the volunteers. I hope she wasn’t too scarred by the experience and came back up to lay her eggs on the beach before too long. Daytime excavations were also very interesting. I never tired of scooping out any latecomers who had overslept compared to their siblings who had hatched a few nights earlier! Counting empty egg shells, shifting heavy buckets of sand and opening the smelly rotten ‘juevos’ (eggs) was all part of the job and it was great to know I was making a real difference to the research projects into these majestic creatures. In my spare time I walked the beach taking photos of the stunning scenery and beach critters, taking a dip in the tide pools with my new pals – and occasionally visiting the wifi to touch base with home! My highlights were being so close to the beach, watching the hatchlings clumsily waddle to the sea, and the laughs we had sitting around in the volunteer house. If you would like to take Faye’s advice and get involved in this awesome programme then check out our website.